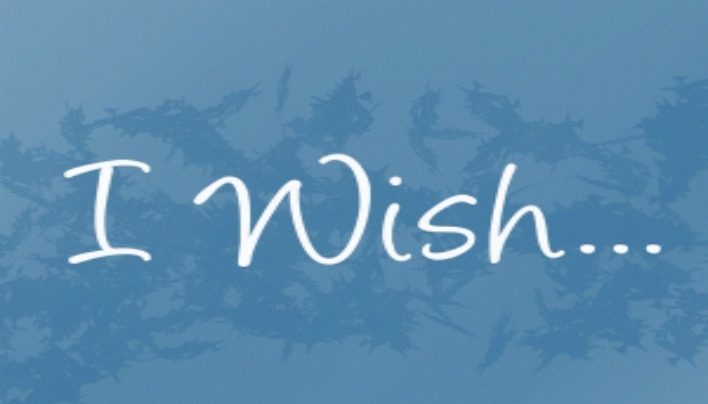 Someone has wisely said that it doesn’t cost anything to wish. But, how often do we hear the brethren wishing for this and that. “I wish we could have a meeting; I wish brother so and so would not be so hard in his talks; I wish the preachers would not harp on this or that so much; I wish the preacher would bring his family with him; or, not bring them with him; I wish the preacher would dress neater; I wish the preacher would be more common like the rest of us. “Well, now while the others are wishing, suppose that I wish a little”. I wish that all of the members would attend worship every Lord’s day (Heb. 10:25). Then, if someone were absent, we would know to go and see about them, and would not be afraid of running in on a domino game, or of finding him trying to make a horse trade. I wish our brethren would take an interest in singing and try to make it possible to have, at least, one singing school taught in their community every year. If we pay taxes and go to other expenses to have our children taught how to read, etc., then why not go to a little expense to have them taught how to read music? I wish that we would all be able to sing with the “spirit and with the understanding,” and thus “make melody in our heart to the Lord”—(l Cor. 14; Col. 3:16). I wish that the preachers would all preach the same thing in every congregation. Remember Paul says “the same commit thou to faithful men, who shall be able to teach others” (2 Tim. 2:2). Brother Gay passed away in 1958. I was only 5 years old, so I don’t remember him. I have heard many stories about Brother Gay and read many of his writings. I remember when I got a copy of his book, A Good Soldier published by Ronny Wade. He had a sermon in that book titled Horse Sense. I never heard Brother Gay preach it, but as a young boy I would go in my room and preach that sermon, and man could I ever preach it. My mama always told me she enjoyed it. I am thankful for Brother Gay and other old soldiers of the cross who stood firmly for the truth. With much respect for Brother Gay, I would like to offer my own Wish List, some of which you may or not agree with. I wish some parents would teach their children that Church is more important than recreation. There are some parents who have their children involved in every kind of activity you can think of; from band to ball to ballet. There are parents who can drive 100’s of miles to take their children to a ball tournament or some other recreational event, but can’t drive 50 miles to take them to a Gospel Meeting. Then when their children grow up and don’t care anything about the church, they wonder “where did we go wrong?” and cry on some preacher’s shoulder. I wish people would be more considerate of their home congregations. Some people just leave their home congregation willy-nilly with no concern about the number of people who are going to be there to conduct services. Some people schedule their vacation and run off during their meeting. Some people allow everyone else to do all the work and put forth no effort to make their home congregation stronger. I wish people would get to Church on time. I am convinced that if some people treated their jobs like they do the Church they would not have a job very long. Who would think of constantly being late for their job? Yet there are people who are consistently late to the services of the Church. Not just a onetime thing, but constantly late. People know what time services start and they should make their plans accordingly. Being on time would help out the man who is making arrangements. He wouldn’t have to wait until the last minute to get the services set up. I suppose he could call people on their cell phone and tell them what to do, but suppose there should be a wreck. Being on time would also cut down on the noise being made during the services and it would not sound like a herd of cattle stampeding as the late-comers arrive. I wish people would go to the bathroom before services instead of traipsing in and out and disrupting services. Some congregations need an urologist more than a preacher. I wish some preachers would not criticize men who speak out and write against questionable practices. To do so is to play the part of Ahab. 1 Kings 18:17-18 “And it came to pass, when Ahab saw Elijah, that Ahab said unto him, Art thou he that troubleth Israel? And he answered, I have not troubled Israel; but thou, and thy father’s house, in that ye have forsaken the commandments of the Lord, and thou hast followed Baalim”. Such men become an enabler for more and more moves away from the truth and they need not cry “foul” and complain that they have been mistreated when they, themselves are called into question. By their fruits shall ye know them, Matt.6:24. I wish men would not condone sin when they like the person or the group or person practicing it. Isa 5:20 “Woe unto them that call evil good, and good evil; that put darkness for light, and light for darkness; that put bitter for sweet, and sweet for bitter”! I wish men would not stand idly by while error is being taught. Men should stand up for the truth and fight against error as they are taught to do in the Bible. Jude 3 “Beloved, when I gave all diligence to write unto you of the common salvation, it was needful for me to write unto you, and exhort you that ye should earnestly contend for the faith which was once delivered unto the saints”. I wish song leaders or song pickers would choose songs appropriate for the occasion. Don’t lead hard, difficult songs during the Lord’s Day worship. Make sure you have all the parts for the song you are leading. I am all for people learning new songs. Anybody who knows me knows how important I think singing is. But know your limitations. You might want to practice a new song on Wednesday night or at the evening Sunday service before you bring it out on Sunday morning. I wish young Christians and other Christians considering marriage would marry only in the Lord. God forbid ancient Israel from marrying people of other nations Deut. 7:1-4. If in times past we have examples of God’s people being corrupted by marrying people of other nations what makes us think that today would be any different. Paul’s instruction to the widow was to marry only in the Lord 1Cor.7:39. This is good advice to any Christian contemplating marriage. I wish Christian sisters would stop posting scriptures on Facebook, in clear violation of Paul’s prohibition on women teaching in public, 1 Cor. 14:34 and 2 Tim. 2:12. And while I’m on Facebook, I wished people would watch what they like on Facebook. I’ve seen some Christians like some things that are as unscriptural as they can be. I wish people would dress more appropriately when attending the church services. You would not go to a meeting with the President dressed inappropriately, why do it when attending a meeting before the King of kings and Lord of lords. If anyone deserves our best, surely the Lord does. Finally, I wish all Christians would follow these suggestions. Dictionary.com defines “dilemma” as “a situation requiring a choice between equally undesirable alternatives.” A perceived moral dilemma Christians face involves determining how open-minded one should be towards opposing doctrines. If I am too closed-minded I might not come to the knowledge of the truth; if I am too open-minded, I may not have any concept of what truth is altogether. These are equally undesirable alternatives. However, the bible gives the perfect solution: study. We cannot know God’s will unless we study. This is not only how we find truth, but is necessary in pleasing God (2 Timothy 2:15). Both knowledge (Eph. 5:10) and comprehension (Eph. 5:17) of God’s will are placed in our hands—it’s a huge obligation, but still our responsibility. But do we have to be open-minded? Yes and no. James 1:21 and Acts 17:11 stress the importance of receiving God’s word, the Bible, in the quest for truth and in salvation. However, we should filter the reception of doctrine through study of Scripture. God is not the author of confusion (1 Cor. 14:33). He does not want us to walk through life with the lights off, so to speak, uninformed of what we should do and so open-minded we accept whatever we hear as truth (Col. 2:8, Eph. 4:13-14). How can we please God if we are not doing what he said to do? It is rather difficult. The Spirit tells us to keep the traditions that originated with Jesus and the apostles (1 Cor. 11:1-2) and not with man. I love how the New American Standard Version renders Hebrews 2:2-3: “For if the word spoken through angels proved unalterable, and every transgression and disobedience received a just penalty, how will we escape if we neglect so great a salvation?” God’s word was not to be altered. Why tamper with New Testament Christianity? 2 Timothy 3 warns that men who have a form of godliness (v. 5) will deceive, and that more and more men would deceive (v. 13), but Paul tells Timothy to continue to do what is right (v.14) and study (v.16-17). 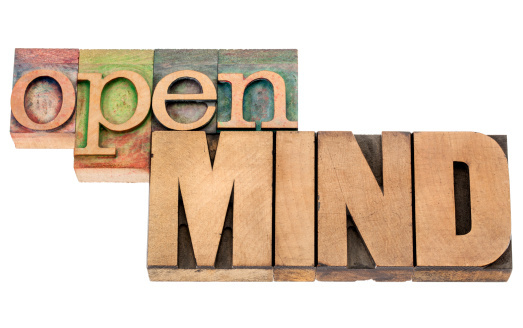 How open-minded should I be? I should be open-minded enough to receive God’s word, but closed-minded enough to recognize when a teaching is not from God…and wise enough to know the difference. The question that I believe everyone needs to be asked in today’s world is , “Are You Ready?”. You could take this question to mean several different things,but I want to take it to ask, if you are ready to put heavenly things above earthly things. Matthew 6:19-21 says, “Lay not up for yourselves treasures upon earth, where moth and rust doth corrupt, and where thieves break through and steal: But lay up for yourselves treasures in heaven, where neither moth nor rust doth corrupt, and where thieves do not break through nor steal: For where your treasure is, there will your heart be also”. There’s a lot of things on this earth that are easy for us to put ahead of God and it’s very tempting. It doesn’t matter if we ever have great fame or money, or be great in sports,or anything like that. What does matter is making it to Heaven. In fact that’s the only thing that matters. Getting to Heaven and taking people with us is what counts. Sometimes we as people let our earthly desires get us off track of our heavenly path. That’s something that we have to really focus on and work hard on. Laying up earthly treasures will not get us anywhere. 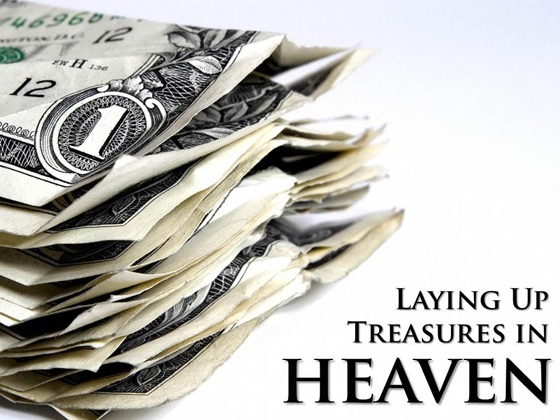 Laying up treasures in Heaven is what matters. ​The name Christian has become abused so much by religious people today that its true meaning is virtually unknown. Today, a person is allegedly a Christian by doing nothing more than liking Christ. This is such a misrepresentation of what the Bible defines to be a disciple of Christ-Christian. The disciples of Christ were first called Christians at Antioch (Acts 11:26). These disciples called Christians did more than just like Christ. We see this fact by backing up only a few verses. Luke says in verse 19 about these same disciples, “Now those who were scattered after the persecution that arose over Stephen traveled as far as Phoenicia, Cyprus, and Antioch…” This introduces the first of no less than two important criteria required to meet Christian status. ​The first requirement to be a Christian is sacrifice. The disciples in Antioch clearly endured sacrifice. This is what Jesus told His disciples would be the consequence of following Him. Jesus declared during His Sermon on the Mount, “Blessed are you when they revile you and persecute you, and say all kinds of evil against you falsely for My sake,” (Matthew 5:11). He would later go on to say in Matthew 16:24-25, “If anyone desires to come after Me, let him deny himself, and take up his cross, and follow Me. For whoever desires to save his life will lose it, but whoever loses his life for My sake will find it.” To take up a cross implies bearing a burden. Even mentioning the idea of bearing burdens will cause many beyond thousands of nominal Christians to lay down this name instantly. However, Jesus did and does not want lukewarm disciples (Revelation 3:15-16). This is what the apostle John had to say about Christians by name only, “He who says, ‘I know Him,’ and does not keep His commandments, is a liar, and the truth is not in him. But whoever keeps His word, truly the love of God is perfected in him. By this we know that we are in Him.” John could not have been clearer in separating Christians from liars. ​The second ingredient to being a Christian is obedience to Jesus’ plan for salvation. The apostle Paul, while talking to Agrippa said, “’King Agrippa, do you believe the prophets? I know that you do believe.’ Then Agrippa said to Paul, ‘You almost persuade me to become a Christian,’” (Acts 26:27-28). King Agrippa is the perfect parallel to today’s “Christian” who does nothing more than like the idea of Christ. The only difference: Agrippa did not pretend to be a Christian. That is because Agrippa knew becoming a Christian involved more than liking Jesus and/or believing in Jesus. If belief was all God required then Agrippa could have rather said without reservation, “I am a Christian.” However, Agrippa was unwilling to fulfill all requirements. He was unwilling to, “Repent, turn to God, and do works befitting repentance,” (Acts 26:20). What those works consist of is another story for another occasion. ​Once again, few so called Christians would be willing to have their physical bodies torn to shreds by wild beast in the coliseum. Few today would let a Muslim kill them for wearing Christ’s name. Second to none among the masses are willing to bear any kind of cross. Still fewer will follow God’s simple plan for salvation exactly as God directs in His written will. A more appropriate name for such persons is Liar. Galatians 2:2 I am crucified with Christ: nevertheless I live; yet not I, but Christ liveth in me: and the life which I now live in the flesh I live by the faith of the Son of God, who loved me, and gave himself for me. ​In the book of Galatians, Paul uses some interesting words when speaking to the Galatian brethren about the old law and essentially, the old man of sin being put to death. The scriptures do not reveal Paul’s reasoning for this per se, but by looking at the background around this letter, we can see why Paul writes to them concerning this matter. As in many of the Pastoral Epistles, most of the congregations that Paul wrote to often dealt with groups of Judaizing teachers who sought to mislead the brethren in keeping some of the commandments of the old law. Paul taught on many occasions that to continue to keep commandments of the old law would be clinging to the old law, which had been nailed to the cross in fulfillment. With that being said, Paul makes a comparison. Since the old law had been fulfilled at Calvary, they should no longer cling to any part of it, except for their learning (Romans 15:4). In like manner, the old man of sin was also crucified with Christ and buried in the watery grave of baptism; therefore, we should no longer cling to the old ways of sin that we observed in times past. But just like with the 1st century church, there are members of the church today who continue to cling to the pleasures that sin offers. They haven’t sincerely been crucified with Christ as Paul taught the Galatians to be in our text. What does it mean to be crucified? It is commonly known that nailing the hands and feet of a prisoner to a cross was the typical way that the crucifixion was carried out. The prisoner would hang in agony until they suffocated because they were physically exhausted to the point that they could no longer push themselves up for air. But when Paul said, “I am crucified with Christ,” he wasn’t talking about the literal act of being crucified. Paul is referring to the fact that when a person obeys the gospel that was provided at Calvary, they are to put away the old law (in the Galatians’ case), but even more than that, we are to put to death the life of sin that we once had been slave to (Romans 6:16-18). In order for us to be truly crucified with Christ, we have to be grateful for the redemption found at Calvary. Without Christ’s sacrifice, there was no hope for the human race. So to show our gratitude and love to the Lord for his sacrifice, the least we can do is serve the Savior (John 14:15). Next, we need to put off the old man of sin in order to be truly crucified with Christ (Romans 6:6). Paul taught this principle consistently throughout the Pastoral Epistles, for instance, when writing to the Ephesians. Paul taught them to put off the conversation or speech of the old man of sin and “be renewed in the spirit of your mind” (Ephesians 4:22-24). Finally, I believe to be crucified with Christ, we must see that Christ lives in us. Paul described a thorn in his side in II Corinthians 12 and it has been widely debated what specifically the “thorn” in his side actually was. But regardless of that, Paul asked the Lord to remove this thorn in his side to which the Lord replies in verse 9, “My grace is sufficient for thee: for my strength is made perfect in weakness. Most gladly therefore will I glorify in my infirmities, that the power of Christ may rest upon me.” When we are crucified with Christ, we need to grasp the fact that Christ’s power is manifested in our weaknesses. But his strength can only be seen if we are committed to serving for a lifetime. Because we are human, we are weak. But when we allow Christ to live in us by following his commands, his strength is our rock and we can overcome the infirmities of being human and escape the slavery of sin when Christ lives in us! May we all be like the great apostle Paul—crucified with Christ. “Think before you speak” is an axiom that has been handed down for generations, and it is well that it has been because this principle has a firm base in scripture. Exhortations to control the tongue, as well as to exercise self-control in all areas of life, abound in both the Old and New Testaments. James is the New Testament writer who has much to say about controlling the tongue. His most aggressive statement has to be in James 1:26 where he says, “If anyone among you thinks he is religious, and does not bridle his tongue but deceives his own heart, this one’s religion is useless” (NKJ). It is one thing to say that a person may be weak in the faith, but to say that his religion is useless takes the situation to an entirely new level. Reading such words leaves us almost breathless and at least perplexed about how we are to deal with our own tongue. Since we realize God never gives a command that it is impossible to fulfill, we know James does not mean we are immediately doomed to defeat. He means that, while we may tame wild animals and have confidence they are under control, that never happens with the tongue. We may control our tongue for many years; yet during a moment of weakness, if we let our guard down, we may say things that will cause untold, sometimes even irrevocable, damage. So his point is that we can never feel confident that our tongue is completely conquered-that we can say we will never have to worry about that problem again. So with our tongue we must ever be on guard. The lesson is clear. We must think carefully about the impact of our words before we let them fly from our lips. What we say to others can come across to them in ways we never intended. Words can cause hurt, they can cause division, they can cause confusion. But we must weigh our words so that none of these is a problem. The most common sin of the tongue is reacting angrily to another person because of something he says or does to us or perhaps just “flying off the handle,” as we say- that is, reacting angrily and immediately to a situation without thinking.